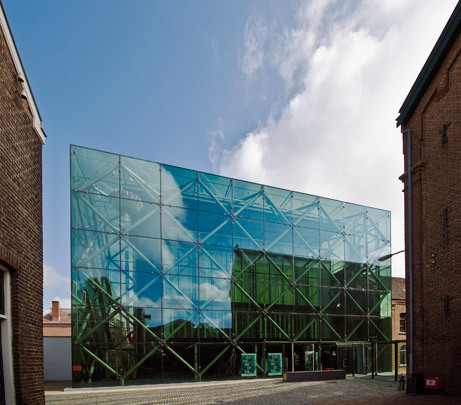 The textile museum is housed in a clutch of old factory sheds belonging to the former woollen factory, Mommers & Co. This complex also had to house a city museum and a regional archive. The archive occupies a box lifted clear of what used to be the damask weaving mill and wrapped tightly in a 'raincoat' of black PVC fabric. A new glass tower contains the entrance, a museum shop, two meeting rooms and a reception platform on the top floor. It also draws together the components of the textile museum in the factory halls. The tower's supporting structure is a three-dimensional lattice frame of steel tubes. A woven net screen behind the glazed front facade can be lit up from the inside to announce exhibitions.